Having read my first Kristen Ashley book last week and really enjoying it I decided I would try and read a KA book once a week. 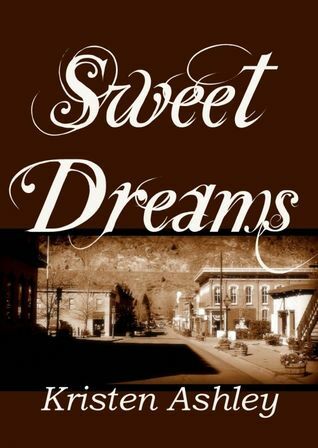 So this week I dove into book 2 in the Colorado Mountain series, Sweet Dreams. Now the bar had been set high for this book, several people had told me that this was their favourite book of the series and had said to me "wait until you meet Tate" so I was expecting something pretty damn good. This book is told from Lauren's pov. Lauren has left what she thought was a perfect life behind her and divorced her husband after she found out he cheated on her. Feeling like there is nothing special out there anymore she goes looking for a "nothing special" quiet town to settle in. Driving through Carnal, a small biker town she thinks she's found it. She stops at a small motel and gets a job at the local bar where she meets one of the bar owners, Tatum Jackson. Unfortunately its not a good day for Tate and he says some things about Laurie in anger that he doesn't mean. she unfortunately overhears and this does not start the relationship well for them. But that's fine Laurie doesn't want anything to do with Tate either so she tries to stay clear, especially as half the town are advising her to not get involved with him. Tate does have a change of heart though and although Laurie tries to fight it at first she eventually gives in. Then tragedy strikes and a barmaid is brutally murdered, and Tate, who we find out is actually a bounty hunter, has to leave Carnal to go on the hunt. but not before telling Laurie that he wants her on the back of his bike when he returns. Tate is gone a long time though without so much of a word and Laurie doesn't speak biker so has no idea what he meant. She thinks that he doesn't care, so life moves on for her. When Tate returns he is not happy especially when he finds who Laurie has moved on with. But when an family emergency arises and Laurie has to fly home Tate takes it upon himself to see her there safe and they spend sometime together. As with the first Colorado Mountain book, its not all about Laurie & Tate. In this book there is a serial killer on the lose who has recently started targeting women from Carnal. Throw in a feud between Tate and a town member that leaves you wondering why there is bad blood, Tate's crazy ex and bits going on in the townsfolk's lives and once again you have plenty to keep you engaged in this book. An who wouldn't melt, he was a biker, a bounty hunter but was very caring and protective of his family, friends and Laurie. Laurie was great, but not perfect, she had a lot of attitude though even though she felt like she was nothing special. Speaking of Nina you do get a glimpse of her in this book which was a nice touch to hear a bit about her and Max after we left them in The Gamble. I really enjoyed the mystery of the serial killer, knowing that it could be someone from town, someone you knew, I had two theories but again nothing was close to the truth! Once again this book had me totally engrossed and I really looked forward to the part of the day when I could sit down and read it. Again I definitely recommend this book, especially if you like hot alpha male bikers! I'm really looking to starting the next book in the series. This is one of my favorite KA books! I've reread it three times already, and I will probably do so again in a couple of weeks.